A THUG who kicked his pregnant girlfriend in the stomach after returning home from a far-right Scottish Defence League march has been jailed for more than four years. James Mullen squeezed Christine McLeod’s throat with his bare hands during the attack and at one stage she curled up trying to protect her stomach as he repeatedly kicked her. Mullen, then 19, also injured a ten-year-old girl during his violent outburst and threatened to stab a neighbour who tried to stop the assault. Now 20, Mullen was sentenced to four years and four months in prison at the High Court in Aberdeen yesterday. Speaking after the court case, Detective Inspector Morag Bruce, from Police Scotland, said: “Mullen launched a sustained and violent assault on his partner, who was pregnant at the time. “We welcome this sentence as it sends out a clear message that domestic violence will not be tolerated by Police Scotland. 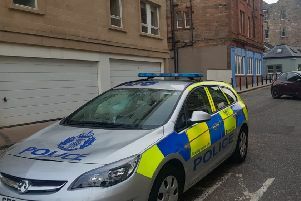 Unemployed Mullen, of the Capital’s Holyrood Court, earlier pleaded guilty to assaulting Ms McLeod, 30, to the danger of her life on July 6 last year at a flat and stairwell in Kirk Street, Leith. Advocate depute Richard Goddard said Mullen had moved into the flat the day before the attack, having been in a relationship with Ms McLeod, who was six weeks pregnant with his child, for several months. The court heard Mullen had attended a Scottish Defence League march in Aberdeen on the day of the attack and consumed “a large amount of ­alcohol”. He drank Buckfast, vodka and beer then passed out on the bus home and woke up in a foul mood. Returning home, Mullen launched the assault on Ms McLeod, grabbing her by the throat and forcing her to the floor. The young girl heard Ms McLeod’s cries for help and tried to intervene, but she ended up having her arm repeatedly slammed in a door. He then began kicking his terrified partner in the head and on her side. The woman managed to get out of the flats with the help of a neighbour, Slawomir Slawinski, who was also assaulted.Mullen also pleaded guilty to assaulting the girl and assaulting Mr Slawinski.